There are many ways to lock the doors on a cargo trailer. The simplest and least expensive way is to purchase 3 padlocks. They can be keyed alike or keyed differently depending on your tastes. The Master #40 or Chinrose D-70 are the most popular choices sold on HeartlandLock.com and both offer a relatively guarded shackle. The Master #37 is also a good choice and all three of these are available in keyed-alike sets. The Master Lock models can also be paired with many other Master Lock products such a receiver locks and coupler locks. While a padlock provides some protection, the weak link (and where the thief is usually going to attack) is the hasp itself which is quite exposed. The hasp is generally easier to cut than the hardened shackle of the padlock and often more accessible. If you want better protection than a padlock, expect to spend more money, but you can get a lot more bang for your buck. There are two products that we offer that stand out. A few years ago, Trimax took a lock commonly known as a “hockey puck” lock and improved it just for trailer use. The “hockey puck” was originally made by American Lock and was very popular in the vending machine industry. People used them on trailers, but with the variety of trailer hasps out there, they often didn’t fit. Trimax took the lock, made it thicker and made the pocket in the back taller and deeper so that it fits virtually all hasps found on trailers (including semi-trailers). It is called the THPXL and is one impressive hunk of metal. The THPXL’s main feature is that it almost totally covers the hasp. Since the keyway is facing down (in most applications) it is fairly weatherproof and darn hard to pick or drill the cylinder. They come in keyed-alike singles or in a keyed-alike 3-pack on the HeartlandLock.com website. Finally, we present the Blaylock DL-80. The DL-80 was designed from the ground up as a trailer lock. It features an aluminum body and a tubular key. I have never seen a trailer hasp that it didn’t fit. 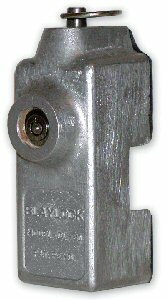 It is our best selling trailer door lock for both enclosed tag-along trailers and semi trailers. It provides excellent protection for the hasp and is just darn hard to get off (so don’t lose your keys). If you have any questions about any of these locks, feel free to email our Locksmith. Q: I have a lock that seems frozen. The key won’t turn. A: First, are you sure you are using the right key? Many keys look alike and you wouldn’t believe how many times someone comes to us thinking the padlock or trailer lock is broken or defective, only to find out that they are using the wrong key. It seems simple, but does the name on the key match the name on the lock? I’ve seen customers using a Trimax key in a Diversi-Tech lock and can’t figure out why it won’t work. If you look carefully at the cylinder as you turn the key and the cylinder turns, even slightly, the problem is not the cylinder. You either have the wrong key (yes, even with the wrong key, the cylinder can usually be seen to move slightly), or it is the internal mechanism of the lock. Okay, so if you are sure you have the right key and the cylinder moves slightly. I would first lightly lubricate the cylinder with a Teflon product or just a drop of light oil. If it is a padlock, I would then see if the shackle has any wiggle in it. If it is frozen solid, you can sometimes tap on it gently with a hammer and break it free. I would then put a penetrating oil like WD-40 or Liquid Wrench in around every opening (shackle holes, cylinder hole, etc.) to reach the inner workings. I have also read that pouring diet soda into a lock will help break a rusty lock (or bolt) free, but I have never personally tried it. BE PATIENT!! Whichever method you chose, it took time for the lock to rust up and it may take time for the penetrant to work. ALSO, don’t be tempted to put a pair of pliers on the key and try to force it. Keys aren’t really very strong and you will usually break the key before you force the lock open. (If you break the key off, see my tip on Broken Keys.) Keep tapping on the shackle, wiggling the key and adding more penetrant. If the lock is loose, you might even want to soak it. FINALLY, after you get the lock open you need to lubricate it well. Many penetrants, including WD-40 will actually flush out the lubricants put in at the factory and you MUST replace them. As I have said many time, my preference is a tiny squirt of a Teflon product (such as the Master Lock lubricants we sell at Heartland Lock) in the keyway and a light oil (like 3-in-One) into the any place I can find where it will reach the internal mechanism. If you have specific questions, please feel free to send me an email. Feel free to attach pictures if you think it will help! Q. Do I need a pick-proof padlock? A. Few thieves are skilled enough or willing to take the time to pick a padlock. Since they don’t care about damage, thieves usually hammer, pry, or cut locks rather than trying to pick them. If you are seriously concerned about picking, look for a lock featuring “spool” or “mushroom” pins. These locks, while not unpickable, make picking much harder. Q. Is there a number on my lock that a thief could use to get a key made? 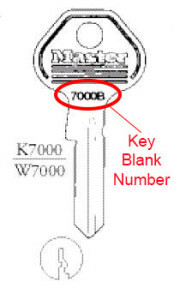 Many people see a number near the blade of a key and assume that it indicates the cut. Usually this is just a number indicating the key blank number. Not having any marking showing the actual cut is is a good thing from a security standpoint, but doesn’t help you if you lose your keys…….so be sure to write down the numbers of the keys keep it in a safe place. Q: What are the numbers on my key? A: There may be several different numbers / letters on a key. Often these numbers indicate the key code, especially if they are found on the bow (handle) of the key. It is a good idea to record these numbers and keep your notes in a safe place. Often, a new key can be obtained if you know the key number. Numbers or letters near the blade of the key often only indicate the key blank used, but not the cut of the key. Q: What should I do with the extra keys that came with my lock? If the key you use regularly is lost or stolen, you have a spare. Keys also wear with time, both from working in the lock and from contact with other objects in you pocket or purse. If you need additional copies, you will get a better reproduction if you use the unworn spare as the original. People are always asking the Heartland Lock locksmith what they should use to lubricate locks. 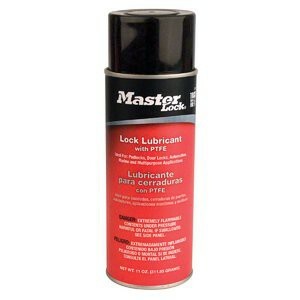 Our Locksmith says: Especially in the keyway, I prefer a Teflon lubricant such as the Master Lock Lubricant (3 different sizes) that we sell under our “Locksmith Services, Keys, Parts” section. These products, if used sparingly, don’t get on the keys and stain your clothing. I am also a big fan of good ole 3-in-One oil, especially for shackles and other moving parts. a drop or two of oil once or twice a year in key places will extend the life of your locks, prevent freezing and make them work like new. While WD-40 is a great product, I do not recommend it because the very low viscosity of the lubricant penetrates well, but does not provide adequate of long-lasting lubrication.